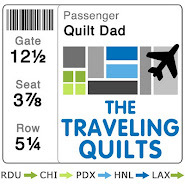 Quilt Dad: Authentic Mini Quilt | Mini Quilt Monday! Authentic Mini Quilt | Mini Quilt Monday! 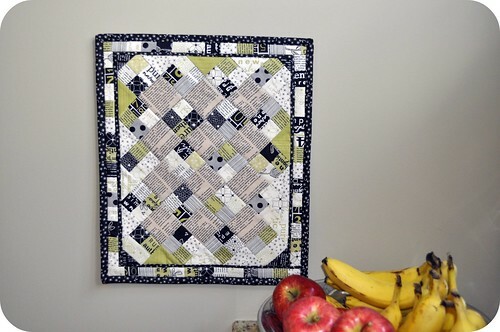 So I'm just squeezing in under the wire, but I wanted to get this posted in time to link up to Faith's Mini Quilt Monday series on her blog, Fresh Lemon Quilts! 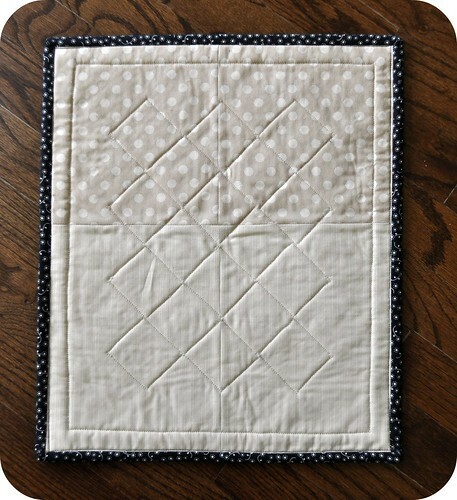 I figured it was a great opportunity to blog about a mini quilt that I recently completed, and the swap for which I made it. A couple of weeks back, Sharon (who blogs at Craizee Corners) asked me if I'd like to be a guest blogger this month on her blog in celebration of Sweetwater month. Sharon likes to feature a fabric designer each month, and invites her friends to come talk about their experiences working with that designer's fabrics. "Sure", I thought. 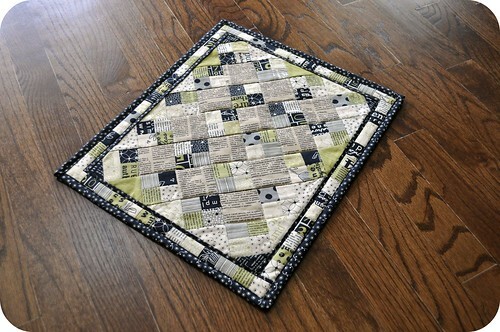 "I love Sweetwater's fabrics, and I'd even like to make something to show off on Sharon's blog!" At the same time, I was planning a mini quilt for Kait as part of the Triangle Modern Quilt Guild's mini quilt swap -- a perfect opportunity, I thought, to pull out my small but beloved scrap stash of Authentic, Sweetwater's first line with Moda. These scraps were my leftovers from my pillow project featuring the line on the Moda Bake Shop. I really, really loved how this little quilt came out. You can read my full Sweetwater month post on Sharon's blog here, and see Kait's blog post about receiving this quilt here. I mentioned this quilt was made for a swap, so want to see what I received in return? With those birds added and framed so beautifully with a chocolate brown binding, it's a beautiful addition to my wall decor. 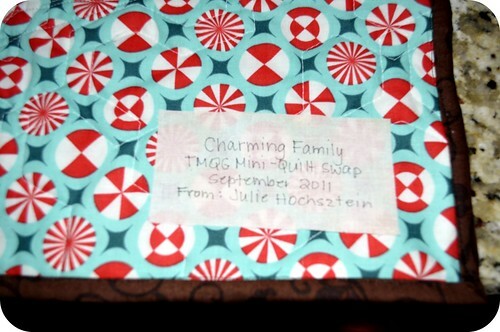 Thanks so much, Julie -- I LOVE my quilt! 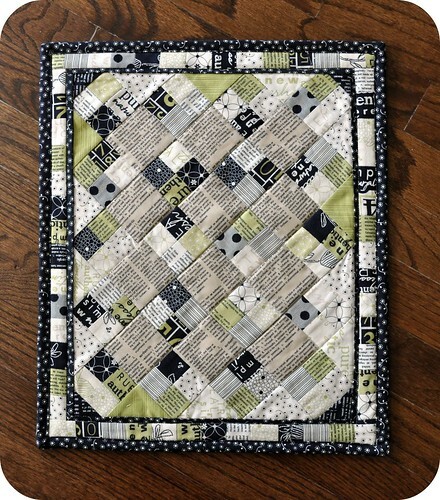 For more mini quilt love, be sure to check out Faith's Mini Quilt Monday series. That first quilt is quite eye catching and so different. Love it! Sounds like you have your work cut out for you with that to do list! Both of these little quilts are just fantastic.....I'm off to see if I have that issue of Quilts and More. wow, both of these are fantastic. I love the colors in yours and I love the white birds on the hexies. minis are so fun for trying new things and showcasing certain fabrics. faith's series kind of makes me want to make a bazillion of them. I like your use of the Sweetwater prints..the rotating squares makes it really geometric. 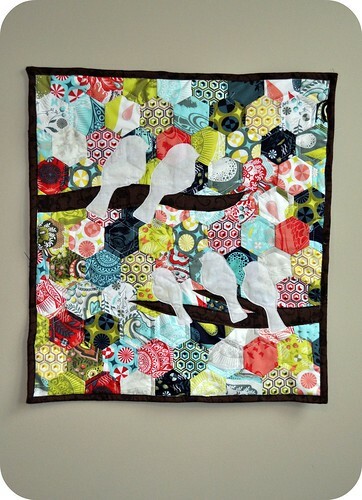 And you are a lucky swap recipient this time, love birds on hexys! The border on your mini is great! 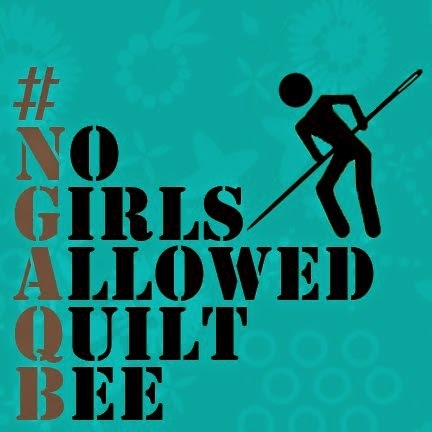 Love the quilt you made for the swap, and the one you received is fantastic! Wow John, I LOVE it! !